The Iberostar Cozumel is located on the southwest coast of Cozumel island, Mexico, approximately 20 minutes from Cozumel's airport. This all-inclusive resort is popular with couples seeking a romantic getaway as well as with families looking for a vacation spot to enjoy diving and snorkeling adventures. Iberostar Cozumel offers a fun and relaxed environment, and is more laid-back than other Iberostar resorts in the Riviera Maya. The resort grounds are lush, with meandering paths between brightly colored bungalows and abundant tropical vegetation. Wandering the resort you will come across animals such as flamingos, peacocks, and iguanas. The resort is designed to complement its natural tropical surroundings: buildings, pools and pathways are surrounded by luxuriant greenery. 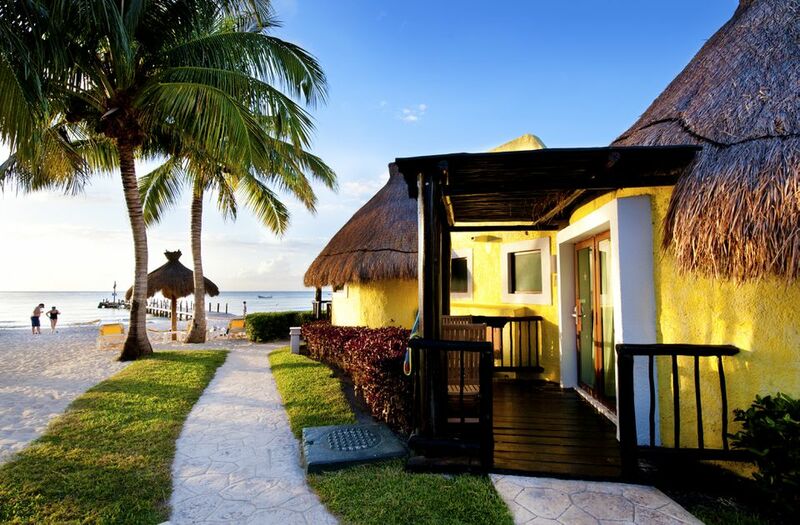 The Iberostar Cozumel has achieved Green Globe Certification, evidence of the resort's commitment to sustainability. Dining options at the resort include two à la carte restaurants, an international buffet and a snack bar. The a la carte restaurants require reservations, and have a dress code: men are required to wear long pants. The Mexican restaurant, El Sarape, offers authentic Mexican food, and the steakhouse, El Cedral, offers an array of savory meats in a steakhouse setting. Another option is the Star Rock Cafe which offers snacks in the evening and later (from 11 pm to 2 am) turns into a disco. Scuba Diving, Snorkeling and Watersports: The Iberostar Cozumel is situated on the shores of Cozumel's national marine park, between Palancar and Santa Rosa Wall reefs, making it an outstanding location for scuba divers and snorkeling aficionados. You can also choose from an array of water sports such as windsurfing, sailing, and kayaking, which are included in the all-inclusive plan. Spa Treatments: The on-site spa offers a variety of services including massages, facials and beauty treatments. Open-air Jacuzzis are available in the spa - complimentary, but a reservation is required. Kids Club: Children are kept busy at the kids' club with scheduled activities, their own swimming pool, playground and a mini-disco in the early evening. Day trip to Playa del Carmen: Guests at the Iberostar Cozumel can enjoy the facilities of the Iberostar Tucan and Iberostar Quetzal in Playa del Carmen for the day (9 am to 6 pm) without paying for a day pass (transportation not included). The property features 300 standard guest rooms, four junior suites and two presidential suites. All guest rooms offer air conditioning, ceiling fan, hairdryer, telephone, TV, stocked minibar, and a safe, as well as a private terrace or balcony with a hammock. Standard rooms are on the small side, but perfectly adequate, with either two double or one king-size bed. Junior suites are on the second-floor, enjoying beautiful ocean views, and have a comfortable sitting area. The spacious presidential suite is on the first floor and has a private pool. The Iberostar Cozumel has a 170-meter beach with white sand and plenty of beach chairs for lounging about. If you want to go swimming, it's best to take water shoes, or enter the water from the pier, as the shoreline is rocky. The resort's large free-form pool is divided into three sections, with a main area, activities area and children's area, as well as a swim-up bar. The Iberostar Cozumel is a great choice for people looking to have a laid-back, relaxing getaway at an all-inclusive resort with ready access to all of the great water sports the island has to offer. Take a photo tour of the Iberostar Cozumel. As is common in the travel industry, the writer was provided with a complimentary all-inclusive stay for review purposes. While it has not influenced this review, we believe in full disclosure of all potential conflicts of interest. For more information, see our Ethics Policy.